"No. You can't cheat," Jacob Scarbrough said as he kept an eye on Indiana State University senior Justin Dawson. 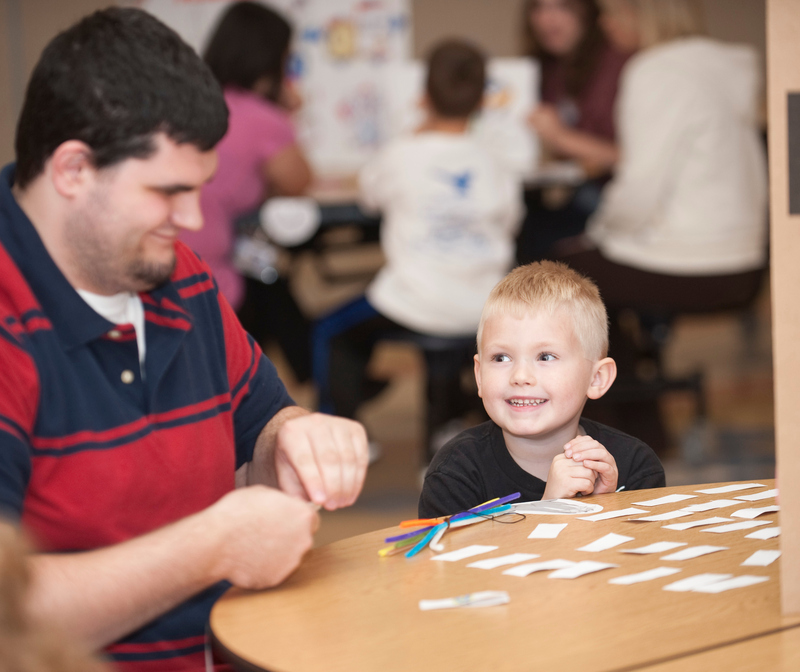 Scarbrough, a kindergartner at Franklin Elementary School, played Dawson in game where he had to match words to the letters with which they start. "You can't trick me," he told Dawson as he picked up matching cards. "I found it." The game, along with the book "Gregory the Terrible Eater" was part of Book Talk and Tea held Tuesday at the elementary school. During the program, the elementary or special education majors introduce kindergartners to new and classic books through various games and activities that incorporate math, science, art and reading. Though the kindergarteners enjoy a fun day, Dawson said the college students learn as well. "Obviously, spending time with kids is a big part in getting us ready to go out in the classrooms," he said. During the morning session, kindergartners spent time learning and playing games connected to 12 books. "Our hope is to get kids interested in reading, reading for fun, reading across the curriculum," said Lisa Cutter, assistant professor of elementary, early and special education. 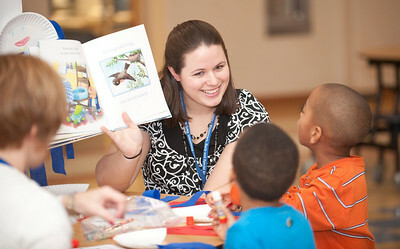 The university students also learn how to use books to engage children using educational standards. Elizabeth Hoseman, a senior elementary education major from Terre Haute, said she plans to use books in classroom learning centers when she becomes a teacher. "At such a young age, to have any activity with a book makes them understand books and to want to dive into books," she said. "It makes it more fun." Her partner for reading and teaching "Good Thing You're Not an Octopus," Veronica Silver said the soon-to-be teachers also are exposed to numerous books. "We learn what kind of books we could use with students and ideas of activities we could use," said the sophomore elementary and special education major from Williamsport. As kindergarten teacher Cindy Andrews looked across the room of students busy making octopuses, bowling with a beach ball and empty water bottles or making wands, she said that in an hour they students are getting exposed to many different books. "They're fully engaged. They're excited," she said. "They're learning." 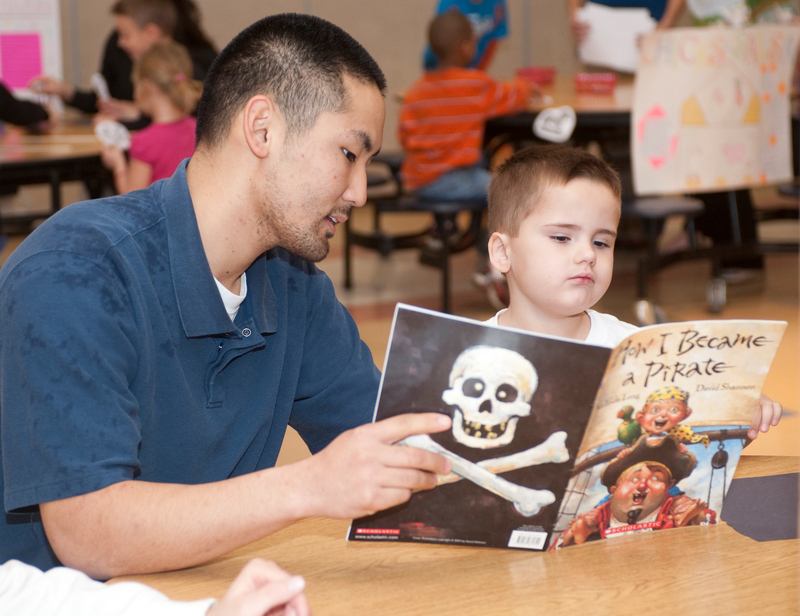 Joshua Langford eagerly followed along as Ethan Kellner read "How I Became a Pirate." As he listened to the story, he forgot about drawing his pirate flag. Instead he giggled at pictures as he held his piece of yellow chalk. "This helps us interact with children and see how they learn differently," said Kellner, a sophomore elementary education major from Elberfeld. Even more important than getting children excited about reading is the time throughout the semester that the same college students spend with their kindergarten reading buddies, according to Andrews. University students work with the kindergarteners on vocabulary, letter sounds, rhyming and sight words. "Every day they look at the schedule to see if their ISU reading buddies are coming in," she said. In return, the kindergartners get one-on-one attention with college students who are creating plans to further bolster the child's ability each week. "Where else are you going to get that working together for an hour each week?" she said. Yet, Andrews said, the children enjoy Book Talk and Tea. "It's like the highlight of the year for my students," she said. "They love it." ISU students hold book fair at Franklin Elementary School.